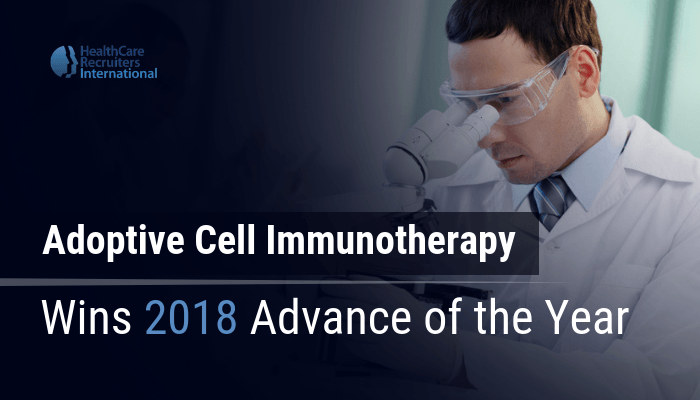 The American Society of Clinical Oncology named adoptive cell immunotherapy their 2018 Advance of the Year. In recent years, this unique method for cancer treatment has made tremendous advancements in clinical development, resulting in this prestigious award. While adoptive cell immunotherapy has been in clinical trials for over 20 years, it’s just now becoming available to select patients through recent advancements and testing. Although implementation remains limited at this stage, there is an enormous amount of potential for this type of cancer therapy going forward. Traditionally, there are three pillars of cancer treatment: surgical, chemotherapy, and radiotherapy. Immunotherapy emerged in recent years as an alternative to those three treatment pillars. Immunotherapy aims to boost the body’s natural defenses to fight cancer by artificially restoring the patient’s immune cells, which then target cancer cells and eliminate them. The biggest challenge with immunotherapy is identifying cancer cells, as cancer cells are adept at masking themselves from immune cells. Adoptive cell immunotherapy takes a different approach, as it extracts a patient’s immune cells, re-engineers them to detect cancer cells better, then injects them back into the patient. What makes adoptive cell immunotherapy even more groundbreaking is the therapy only needs to be given once, as opposed to a series of therapies required for other cancer treatments. As with most cancer therapies, there are risks associated with adoptive cell immunotherapy. Due to the powerful nature of the treatment, some serious side effects have occurred. Two side effects include cytokine release syndrome (CRS) and neurological problems. CRS occurs when cells produce inflammatory molecules. Consequently, CRS can cause fever, low blood pressure, difficulty breathing, and organ-related issues. While CRS can be a life-threatening problem, there is a treatment method to stop and cure CRS. When patients of adoptive cell immunotherapy received treatment for CRS, symptoms went away within a few days. Neurological problems associated with adoptive cell immunotherapy include difficulty speaking, delirium, hallucinations, seizures, and coma. Like the symptoms of CRS, in most cases, these side effects went away in a few days. Need a new hire for your team or organization? We’re the healthcare industry’s first choice for top talent. Contact us today to learn more about our approach to recruiting healthcare talent.